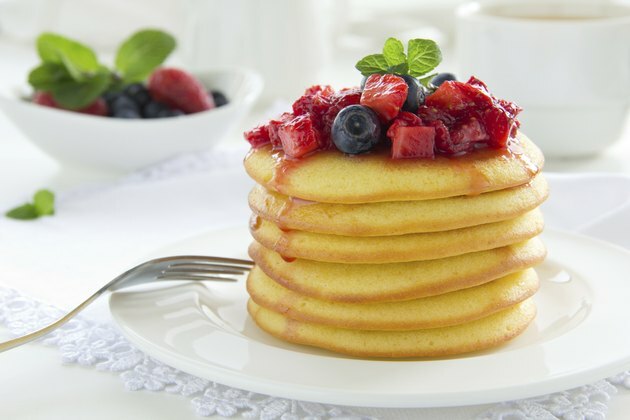 Smothering your pancakes in syrup and butter adds excessive calories and sugar to your breakfast. 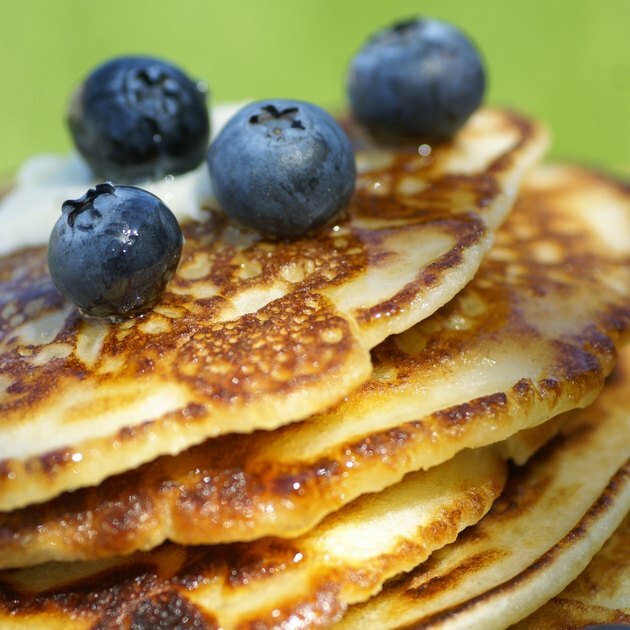 Healthier pancake options add nutritional value to the meal without overloading your meal with fat, calories and sugar. Start with whole-grain pancakes and experiment with various healthy toppings to find a flavorful and nutritious combination. Chop up your favorite fresh fruit for a simple and nutritious pancake topping. Fruit is low in calories if you don't add any extra sugar. 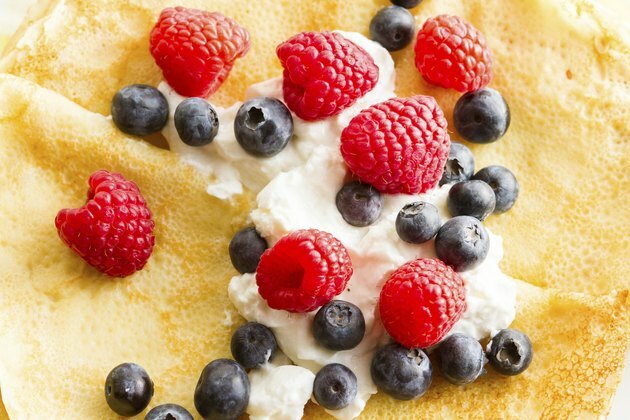 Berries work particularly well on pancakes. Chop or mash the berries and spread them over the pancakes. Mashed bananas are another simple option. For more flavor, add a small scoop of low-fat whipped cream with the berries. A small drizzle of honey adds a level of sweetness if desired. Either peanut butter or your favorite nut butter, like almond or cashew, boosts the protein content of your pancake meal while adding a serving of healthy fat. Spread the nut butter over your pancakes as soon as they come out of the pan. The warmth of the pancakes helps melt the nut butter. Another option is to heat the nut butter for a few seconds in the microwave -- and then drizzle it on the pancakes. Add sliced bananas, a drizzle of honey or chopped nuts for additional nutritious toppers that pair well with nut butters. Apple butter and pumpkin butter are two fruit-based spreads with a texture ideal for smoothing on top of your pancakes. To make your own pumpkin butter, mix canned pumpkin with just enough brown sugar and honey to sweeten it to your taste preferences. Add in ground cinnamon for flavor. 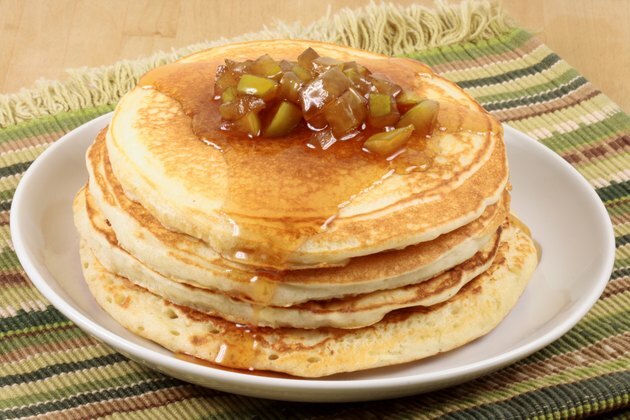 Applesauce, jam or similar fruit spreads also work as a pancake topping. Choose fruit spreads that are low in sugar for the healthiest options. Yogurt provides a creamy pancake topper that is light and healthy. Choose a low-fat yogurt to keep the fat and calories down. The supermarket offers a variety of flavor options allowing you to customize your pancake topping to match your taste preferences. To eliminate extra sugar, start with plain yogurt. Mix in mashed fresh fruit and a small amount of honey to sweeten the mixture. Another option is to combine peanut butter and yogurt with or without honey for sweetening.